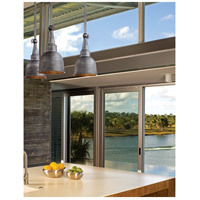 For statement lighting, look to the Raleigh 1 Light Outdoor Hanging Lantern in Old Silver from Troy Lighting. Reminiscent of old farmhouse oil cans, the distinctive design demands attention whether used outdoors or indoors. Crafted from wrought iron and aluminum, the fixture uses 1 (100 watt) bulb for general lighting and is suitable for damp locations. Q What is the baseplate dimension and does the stem come in different lengths? 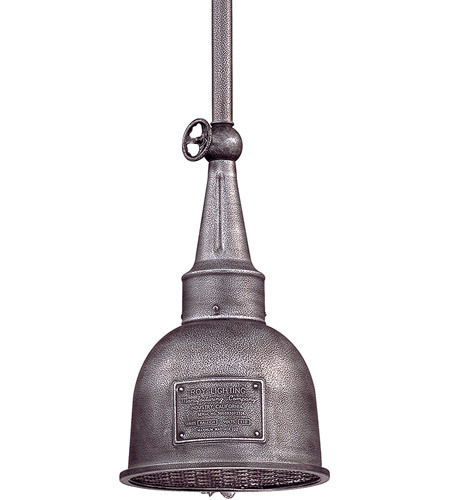 A The Troy Lighting Raleigh 1 Light Outdoor Hanging Lantern F2947 baseplate/canopy is 6" in diameter. This fixture comes supplied with (1) 6", (2) 12" and (1) 18" downrod for various height adjustments. Maximum installation height 66".